We at Super Sure Services are expert in all kinds of fittings, installations and repairs. Whether it is your bathroom, kitchen, drainage, water tanks or sewage system, we provide solutions to all your plumbing-related problems. 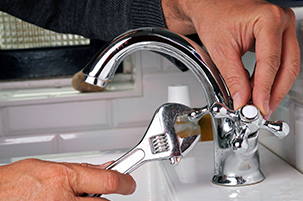 Our plumbers excel in pipe-fitting, installation of geysers, drain and sink issues, running toilet, dripping faucets, leaky pipes and many more. Most of us surely find it frustrating to live with a broken tap, leaky pipe, undone toilet flush or low water pressure during our long showers. But somehow we do live with it or we have to, as we have no idea how to get it fixed. Its too time consuming and we choose to better utilize our time by living with issues. At Super Sure Service we make sure that only an experienced serviceman knocks your door on the time promised. Our plumbers are specialized in leak detection, shower repair & replacement, Faucet repair & replacement, Clogged drain pipe, Tap repair & replacement, all kitchen repair & services....etc.We take commercial & residential plumbing contracts across Mumbai, Navi Mumbai, Thane, Palghar. Call us for quick response and quality work..